lip radio was a collaboration between lip magazine and SYN 90.7 fm (student youth network) that ran between 2004-07. The show featured regular segments, interviews and honest, in-depth discussion about what it means to be a girl today. on 3CR (http://www.3cr.org.au/girlyisgood), Sundays 2-3 pm. 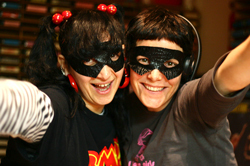 The Girly is Good super heroes, aka Maria and Emily, have declared war on the misogyny of the music industry and arts scenes in general. They will occupy the airwaves until mainstream media give women musicians and artists equal recognition, pay and kudos. The Girly is Good super heroes manifesto states that women shall be celebrated for all their creative work. The program aims to support women artists, film makers, writers, and musicians by allowing them to bask in the super hero powers of 3CR’s Maria and Emily. The powers give a voice to these women to promote their art form or event on the people’s radio station. It is all lots of fun and there is always a happy ending at the end of the show! Sounds pretty good to us. See you on Sundays!